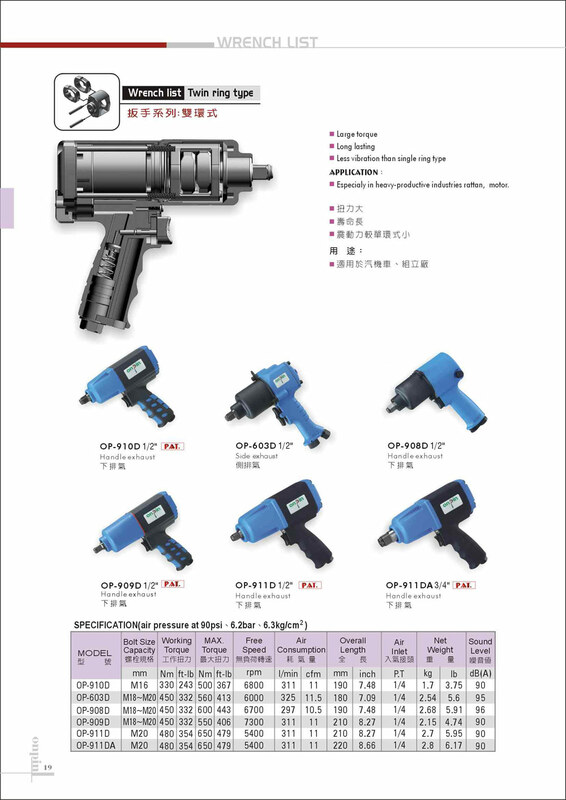 Pneumatic Tool - Hong Bing Pneumatic Industry Co., Ltd. The pneumatic tool is kind of equipment provides more convenience while assembling. Traditional hand tool would need lots of time and exertion, but with our product, you can save these troubles. By connecting to the compressor to drive the device, the working efficiency would be much higher due to the powerful output and rapid working path. Now you can find many kinds of pneumatic tool easily in hardware store or hypermarket; but how to choose a great one? If you are not the master of this product, the best solution is to get it from a reliable supplier. Hong Bing Pneumatic Industry Co., Ltd., as a professional manufacturer, has paid much effort on researching and producing the product from 1974. With years' experience of making pneumatic tool, the quality of our products is well-reputed in this field. Including air sander, air wrench and other products are all made under strict quality control and standard progress. If you need a product most fit for your requirement, just contact Hong Bing, the expert. ‧Especially in heavy-productive industries rattan, motor. If you're interested in our pneumatic tool, please feel free to send your inquiry to us.